1. Boil and grate eggs and potato. 2. Dice smoked chicken finely. 3. Chop onion finely and pour with boiling water. 4. Cut cucumbers in thin strips. 5. Grate melted cheese, chop nuts finely and then mix cheese with nuts. • 6 layer of salad – cheese with nuts. 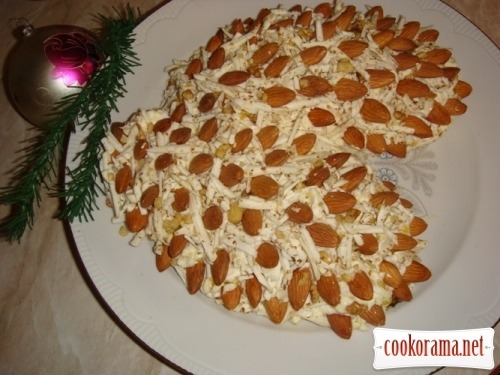 Top of recipe "New Year`s salad «Pine cones»"